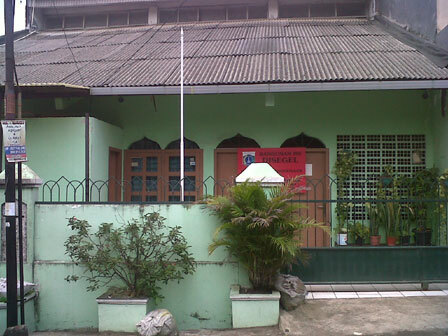 A building which used as Mosque by Ahmadiyah pilgrim on Jl Madrasah Block J No. 28 at RT 02/10, Durensawit, East Jakarta was sealed by East Jakarta Building Supervision and Control (P2B) Sub-Department on Thursday (11/17) due to its building had violated building permit. In the permit, two-story building which established above land with 200 square meters width was only a house. But in fact, the house was used as Mosque by the owner. In this sealing, there was no resistance from building’s owner in the location. Task Executor (Plt) of East Jakarta Supervision and Control Sub-Department Head, Bambang Sudjimanto who led directly this sealing stated that his party has sent the first warning letter (SP) 1 until third warning letter before sealing. By sealing, he hopes there is no more activity which done by Ahmadiyah in the mosque. “We had sent warning letter. But, they ignored it until we finally did seal to its building,” he expressed, Thursday (11/17). District Head of Durensawit, Wahyu Supriatna said that after doing sealing, his party will also control them every day for 24 hours. It is conducted as an effort to prevent conflict which can occur anytime. If there found the same activity, they will follow up it firmly. Meanwhile, Azis (27), one of Ahmadiyah pilgrim who is also as mosque manager stated that since brawl in Cikeusik, Pandeglang, Banten some time ago, it causes no more activity in the mosque. If there any activity, it is only the implementation ied ul Adha prayer and slaughtering to the qurban cattle several days ago. In fact, only about 60 pilgrims from Duren Sawit, Kramatjati and Tebet who joined it. As matter of fact, the activity inside the mosque has been going on since 1997 ago. But, after sealing, he plans to report it to Jakarta Ahmadiyah manager. Next Article The Thinker: Open or Closed?